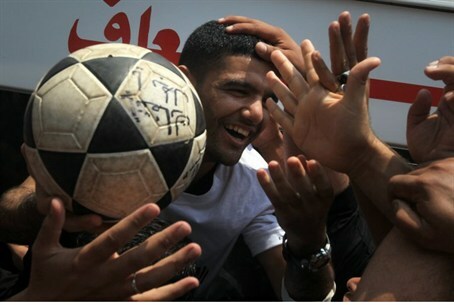 PA soccer player Mahmoud Sarsak says he would attend next month's Barcelona-Real Madrid derby, but not with Gilad Shalit. Palestinian Authority soccer player Mahmoud Sarsak said Saturday he would attend next month's Barcelona-Real Madrid derby, but not in the same stand as Gilad Shalit. Sarsak told AFP the invitation to attend next month's clash of the Spanish giants was dear to his heart but he would not attend if he had to share it with Shalit. “This invitation is very important for me and for the Palestinian people but I will not be able to accept it unless the Palestinian Authority gives me authorization,” Sarsak said. He added that sharing a box with Shalit on October 7 would be tantamount to a "normalization" with Israel, he said. "Sports and politics mix here." In July, Sarsak, who was imprisoned in an Israeli jail on terrorism charges, was freed and returned to his home in Gaza after observing a hunger strike of nearly three months. On Wednesday, FC Barcelona said it had agreed to invite Shalit, a soccer fan who was held captive by Hamas for more than five years, to the Real game. The next day, the Catalan club said it had also invited PFA president Jibril Rajub, the PA’s envoy to Spain and Sarsak to the derby. Hamas reacted furiously, demanding that FC Barcelona keep Shalit away, and urged Muslim media not to broadcast the game if the Israeli attended. "We call on all Muslim, Arab and Palestinian media not to broadcast this game if Shalit attends," Hamas spokesman Sami Abu Zuhri said on Friday. Shalit was released in October, 2011 in exchange for more than 1,000 terrorists held in Israeli prisons, including several convicted of mass murder. Barcelona team officials have clarified that the invitation for Shalit was not meant as a political gesture.